Export market development is like many business activities. It can be tackled in a fragmented, ad-hoc way, or it can be the object of deliberate planning and focused, managed execution. Everyone wants to do it "the right way" to maximize results. The problem is that most folks don't have an instruction manual. 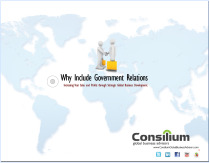 Think of this eBook as a free chapter from Consilium's Export Planning Instruction Manual. steps to "navigate the system"